About the author: Sharanya Manivannan’s writing has appeared on Drunken Boat, Killing the Buddha, The Nervous Breakdown, Monkeybicycle and elsewhere. She can be found online at www.sharanyamanivannan.com and on Twitter as @ranyamanivannan. About the operative: Rosa O (Seattle, WA) is a one-woman island. P.S. Check out our interview at Duotrope, where we are currently rated as one of the 25 “swiftest” and “most personable” markets. Thanks, guys. Back at the end of February, I mailed a patch with Sharanya Manivannan’s story to an operative in Seattle, but it didn’t arrive on time. I’d been planning to take a week off in early March anyway, so I pushed the date for Sharanya’s story back a week, hoping the story would arrive. It didn’t. After three weeks, I decided the story had been lost somewhere in the mail and went about painting another patch to mail as a replacement. Meanwhile, last week, I sent a patch to DC—featuring a story by B.J. Jones—and right now, we’re waiting on the photos that were taken of it. This should be posted as a new issue within the next few weeks. 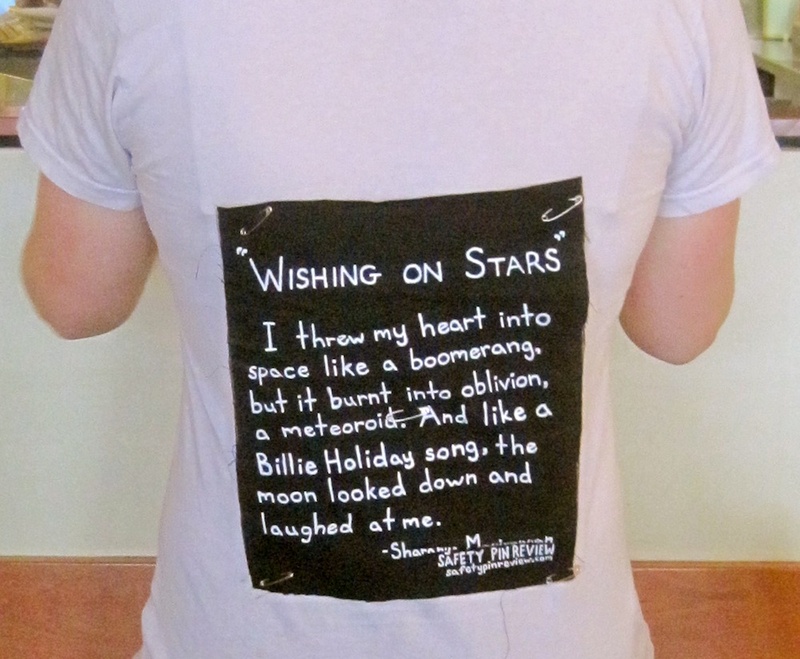 As for Sharanya’s story, “Wishing on Stars,” today I was prepared to mail the second copy when I heard that the original had finally arrived, after a month in transit. God bless the USPS, they do get the job done eventually. So: Sharanya’s story will be worn next week; this is the plan. The posting of the DC-story will be delayed until I get the photos and can give it a solid week’s worth of publicity on the site. I’m sorry for the inconsistency, but this tends to be the case when you’ve got stories darting every which way across the country, occasionally at the cost of a totally reliable publishing schedule. In the next month, we’re visiting both coasts, and then, at the end of April, South Korea. In May: Turkey. July: Norway. So yes, exciting times ahead. This post may be a little too process-heavy to be of much interest, but I just wanted to keep everyone on the up-and-up and make sure you know we’re still alive and kicking quite hard. We want you to know everything that we do. In the meantime, submissions of course remain open, and we’re waiting on a second shipment of 100 SPR pins so you can wear the SPR wherever you go (check out at least two happy pinners, here and here). Please enjoy the weekly Safety Pin Review radio supplemental– featuring this week’s story by Sharanya Manivannan– while we put every ounce of our faith in the postal service to deliver this week’s story-patch to its Seattle operative. Fingers and toes crossed that it arrives tomorrow. Download the radio show, recorded live at WECI 91.5fm, Richmond’s public radio. Listen while you’re drifting off to sleep, feeling heartbroken. It really works to salve the soul, I’m telling you.